Victor: In ’69 you had the same idea concerning the unity of revolutionaries and you supported Krivine in the presidential elections. 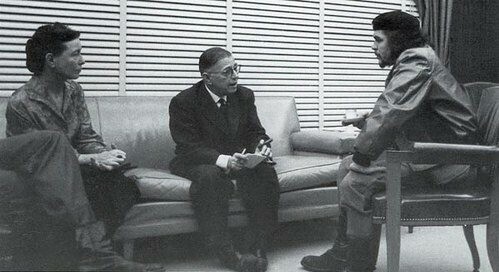 Sartre: I supported him for a while. But I wanted him to say: I am standing for office because it allows you to hear a voice of the extreme left on the television, but not in order to be elected. Victor: Today you are against any Machiavellianism in voting matters: you're going to say this in Les Temps Modernes. But in May ’69 you were Machiavellian? Victor: Nevertheless it was clear from the beginning that he too wanted to count “his votes.” He accepted the rule of indirect representation. Sartre: Yes, and it was regrettable. And it’s not only a Trotskyist error. During the last elections in Italy Il Manifesto wanted to present Valpreda for understandable but erroneous reasons. The result: he was crushed. Sure, extreme left political groups can serve as a fermenting agent in daily life. But those who are under their influence are more numerous than those who claim to be part of them. So the very idea of counting one’s numbers thorough universal suffrage is false, it can’t give an accounting of their real influence in the country. After this I realized that the Trotskyists and the PSU were only partially for illegality, since they gave themselves over to the electoral comedy. The only ones who were truly on the plain of complete illegality — since they even refused the rights the system conferred on them — were the Maoists. To be sure, they sometimes attempted actions grounded in legal justice. But they had to act from without: for example, the popular tribunal at Lens. And in this case, like in all the others where I was with you, the authority of intellectuals was exercised against the class that recognized this in them, against the bourgeoisie. The workers didn’t recognize any authority in me. By connecting ourselves to them we acted at one and the same time inside and outside the system. I have been convinced of the following fact for several years: those who want to do something within the system only end up by preserving it. He who wants to overturn the system by his vote is profoundly in error, since voting opposes the legality of a movement to its legitimacy, e.g., an insurrectional movement. All those who obtain power legally are exactly the same. Look at the UDR and the PC-PS. To vote is to resign your sovereignty to a group who exercises yours for you. Because of this I grew closer to the Maoist group. The trouble was that around ’70-'71 they took a legalist turn, i.e., they constituted Truth and Justice Committees that contest legality from within in the name of legality, and not from without, in the name of legitimacy. The Truth and Justice Committees call for the application of the law and we don’t tell them that there’s another point of view: absolute illegality, or the contestation of the system through the legitimacy of direct democracy. At the same there should be a new increase in action on the part of Red Aid, an organization that doesn’t carry out strikes or occupations of lodgings, but when they do occur assists them illegally. In this way those who have really had enough can go to Red Aid, and those who believe justice can be obtained while remaining within the system can go to the Truth and Justice Committees. I understand your tendency to accept popular movements as they are and at their level of politicization. But I don’t see that your new way of attacking legality is incompatible with your actions of yesterday, that were carried out outside the system. If you abandon this latter you have joined the PSU and the Trotskyists. Victor: The march on Paris by the miners of Bruay was forbidden. Sartre: Yes, but that doesn’t take you very far. You have to reorganize this sector of legitimate illegality, which is where you are really strong. And you should preserve, and not systematically destroy, Red Aid, which alone can serve this purpose. You reproach it for being terrorist, which really means that in the same neighborhood it does door-to-door work — which is an almost legalist form of agitation — and also violent, thus illegal, action, which frightens the people they were able to convince during their door-to-door. Gavi: I am in agreement, in part. If it doesn’t want to be cut off from the people every movement is obliged, at one time or another, to sink its roots in a fertilizer of ambiguous alienating ideas of a dual nature. To have this sacred need for justice is at one and the same time the refusal of a double standard and the desire to repress. It can be normal to take as a starting point needs that have been covered over, fabricated and then turned to other uses by the bourgeoisie. And then from within institutions that are still accepted clearly show that there are contradictions, and then heighten these contradictions in order to arrive at their explosion, to arrive at the point where the masses create their own legitimacy and confront the law. Only I think that from the moment when an organized movement thus makes use of institutions (which doesn’t exclude illegal actions like the march on Béthune) its militants must be fully conscious of the fact that they can no longer say certain things. For example, when Judge Pascal expresses a just attitude towards the miners you can’t at the same time attack Judge Pascal because he is a juge d'instruction, because he’s a fairly repressive judge, etc. But why don’t you recognize that there is complementarity between the work you can do — which is to heighten the contradictions within institutions while all the while continuing to carry out illegal actions — and, on the other hand, a whole current of revolt that is manifesting itself among many young people. This current isn’t organized and thus isn’t subject to the silences of mass organizations: it can say everything. It can be excessive — but excess, too, is part of popular tradition. I'm saying that you, Victor, you can’t measure the effectiveness of this current that expresses itself in a violent and even provocative way. You can’t say that at one moment Bobigny is positive, while such and such a meeting at the Mutualité two years earlier wasn’t. We can’t measure the dialectical relationship that can exist between a mass action and an act of provocation that unfold simultaneously. Certain struggles directly attack alienating ideas, and these struggles often take on an even more provocative aspect due to the fact that those who carry them out are rebels and in the minority. But on the other hand if we want to be immediately heard we have to do what you used to do. All of this can be reconciled. I fear that you will consider what you call ultra-leftism a provocative current, with which you will continue to maintain relations but with which you aren’t in agreement. In the end this is what the Ligue began to do a year or two ago. It marked itself off from the ultra-left movement. And now the Maoists are going to mark themselves off as well? Let’s take Bruay-en-Artois: I think the constituting of a Truth and Justice Committee is a great victory, that you were right to demand that the populace control justice. One thing struck me in Bruay: the only young people who were mobilized were those of mine 4, whose parents were in the Truth and Justice Committee as well as those who were directly involved in the affair. But in general the affair was taken in hand by 1- the women, 2- by people of a certain age. I know that many young people are leaving Bruay, the mines are closing, etc. But the high school, for example, wasn’t mobilized and I wonder if one of the reasons wasn’t the language you used. It was the language of those who made ‘36, those who made ‘36-'39, who continue to defend a traditional morality. Wasn’t there a contradiction between these age groups, these ways of thinking and young people who are more likely to read Charlie-Hebdo. Victor: Problem number 1 since ’68 is expanding the field of opposition between legitimacy and legality. We don’t want marginal groups to be the only ones fighting. Victor: Expanding the field of opposition doesn’t only mean carrying out at such and such a moment illegalist actions that are legitimate, and at others legal actions that provoke a certain number of contradictions within institutions. I used the expression “institutional subversive actions.” When Sartre takes the editorship of La Cause du peuple there is in that action a legal element and an element that breaks with legality. It is this unstable combination that gives the action all its force. Sartre: Except right after that the Friends of the Cause du Peuple set out to carry out illegal actions, for example selling CDP on the street. So there were two types of action at almost the same time. Victor: This is a perfect example of an institutional subversive action. There is not on one side purely illegalist action and on the other purely legal action. An action bearing an element of legality must at the same time bear a critical charge for the established system, an trace of subversion. The combination becomes unstable. The masses having set themselves in motion, it is power itself that assigns itself the task of upsetting the relationship legality-illegality, of “toughening” the movement. Let’s take an example, the example of a failure. Victor: In the mining basin we carried out a campaign so that Moroccan miners could obtain a work card, i.e., the application of the law. It’s the “right to work” that we called for. What could be more in conformity with capitalist law? Nevertheless, it’s a very subversive movement. It puts in question the policy of liquidation of the coalmines. In fact, even while closing the pits these latter need a workforce that can work at their will and that can be easily rejected. This is why Moroccans are forbidden that weak protection that is the work card. It’s very important to define the notion of an institutional subversive action. It completely destroys a strategy flowing from a faulty reading of Lenin that presents itself as follows: I am combining legal and illegal action. I combine “illegal action,” which means I am preparing myself for an armed insurrection. I thus combine an action that doesn’t exist today with other actions that are as legal as can be. I've got a perfect observation point and I accept the rules of the game while waiting for it to go off track. For us what is at the center of tactical thought is this dialectic of action that has its departure point in the conflict between profoundly legitimate, repressed ideas, and ideas that are legal on the surface. It’s a question of transforming this ambiguity into a critical charge. Once a certain level is reached it is power itself that, in committing its stupidities, transforms the relationship between the spirit of submission and the sprit of rebellion, to the benefit of rebellion. Gavi: No, that’s not an answer. “Yes” to subversive action within institutions, but not without subversive action against the institutions at the same time. Ultra-leftism was, whether we know it or not, consciously or not, a state of permanent insurrection against rotten old ideas, social norms. Including those two years when the Maoist movement played at Robin Hood. All of this provoked many breaks, or at least cracks. The world wasn’t overturned, it was upset. Because you failed to understand this you made of J'Accuse a newspaper for old folks. Victor: But going beyond ultra-leftism doesn’t mean opposing the revolt of young people. It’s rejecting a system of political norms that is cut off from popular thought. Gavi: There is no such thing as popular thought as a proletarian oasis. Workers don’t think like bourgeois. And this is necessarily so: they live differently. Which doesn’t mean that they don’t take up the values produced by the bourgeoisie. An apple isn’t a pear, but both are products of the same field. Gavi: You're showing bad faith. Lutte Ouvrière is even more anti-ultra-leftist than the Maoists. Victor: We don’t agree on the meaning of the words. Victor: The ultra-leftist will say to the majority of the populace: this affair — for example, a militant arrested for carrying out an action in support of a strike — demonstrates that justice is class justice. The functioning of our thought is ultra-leftist. Why? Because our point of departure is a thing assimilated by a very small part of the population and, without finding the entry point to the majority of the population, we just throw it away. Gavi: That’s what you did at Bruay? You tried to show that there was class justice? Victor: We supported Judge Pascal. Gavi: By letting it be believed that there could be honest judges. Victor: Doing this is already putting an end to an ultra-left notion that everything that comes from judicial institutions is impure. We must carry out actions on behalf of Justice that are far distant from all that touches upon judicial institutions. The fact of saying: there is a small parcel of justice in the attitude of Judge Pascal, we don’t want this parcel of justice to be eliminated by higher judicial authorities, so we support it: this is an anti-ultra-left practice. Sartre: By what right can you declare Judge Pascal a little more just than another, if it’s not from the point of view of an idea of Justice, which is to say — for the working class — revolutionary justice? Victor: We are in agreement, but the ultra-left way is to say from the beginning: Justice equals Revolution. Going beyond ultra-leftism means taking as a starting point the feeling for justice of the population, with all it carries of ambiguous and alienated, and provoking a logic of action that educates the mass movement in such a way that that it is the subversive elements — who have broken with the established system — who dominate the alienated elements when it comes to Justice. The notion of control in all fields: public control of Justice, the police, the slogan of ’71” “let’s oversee the police,” these notions are ambiguous. The ultra-leftist would say: You want to control Justice, thus in a certain way you have confidence in it. No! Down with Justice! When we say: let’s control the organization of work they can answer us: That means you accept the organization of work, you want to improve it...But an attempt at provoking a large gathering implies the use of slogans bearing a critical charge that carries in its train reformist ideology. Sartre: Except it’s also that that led the PCF to the reformist position it today occupies.